Applied as shutoff device on the pipelines of nuclear power plant systems. 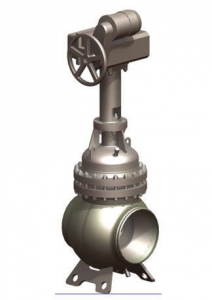 Gate valves refer to the elements of safety classes 2 or 3 in accordance with NP 306.2.141. Installation in the systems of safety class 4 is allowed. Classification designation – 2НО, 3НО. Gate valves refer to groups В or С in accordance with PN AE G-7-008, have category of seismic stability I, II relatively in accordance with PN AE G-5-006. Valve control — manual, bevel-gear speed reducer, spur-gear speed reducer, electric actuator. Valves can be equipped with signal devices of closure limit positions. – for gate valves DN> 300 – 2. II – circulating water, steam, feed water, technical water, overhead product, primary coolant, condensate, oil, nitrogen, radioactive gases. – for gate valves Pw 25 ,40 kgs/cm 2 – up to 250° С. Medium flow direction – all. – on vertical pipeline – all. – on horizontal pipeline – all in the upper semisphere against horizontal plane. Recommended position – actuator upward. Places for gate valve installation – in the premises being served (П), workshops (Б) and under covering (О) AC in accordance with Table 1.